What a busy month! After the American River Festival, we headed to Colorado to attend our friends Nathan Fey and Marin Peterson' s wedding. Nathan is the Colo. American Whitewater rep. and Marin is a Predator Helmet rep. so of course we ended up on the water. After the wedding, 19 of the wedding guests drove to Utah to float the Westwater section of the Colorado River. It is a 17 mile class 3/4 float and we did it as an overnighter. The waves were big, the water cold and brown, the camp, cliffs, scenery, spectacular! My family was in our kayaks and the bride and groom were in our Dynamic Duo, and there were a few other kayaks and about 5 rafts, including our 14 foot raft Big Red, who was being paddled by the brides brother in law. LOTS OF FUN! After floating the river, we drove home, unpacked, repacked and drove to the Feather River Festival. I had a great time running the class 3 Rock Creek section and Class 4 Lobin as well as running the slalom course. 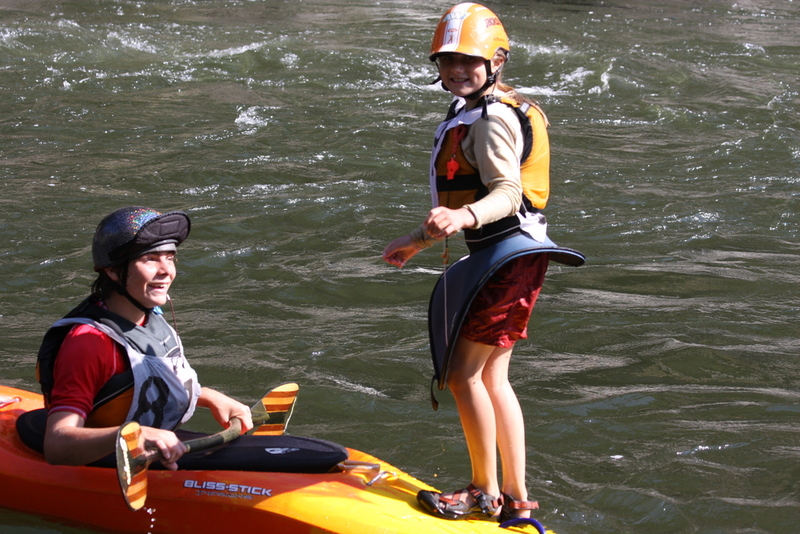 The weekend highlight was the great party and fundraiser for American Whitewater that the Chico Paddleheads put on. They had 2 bands, hula hoops, fiber optic antennas and about 400 people. I was also able to have my friend Molly sleep over in the van. We both slept upstairs with my dogs Wyatt and Kenya-the 2 biggest ridgebacks, and had a blast-and slept well. Now we are home, cleaning and repacking the van so we can go to Yosemite for a week where I'm going to climb Snake Dike, a 7 pitch 5.7 climb on Half Dome. Wish me luck!